It was Mike, a Mike Wilson from a different time, the young man who wrote rock songs with area bands like Crayon and Alexander’s Timeless Bloozband. Wilson was a different man then, a darker former self whose drug problems were so out of control he couldn’t stay in any of the bands for which he wrote songs. He recalls drunkenly sitting in as Santa Claus at old Santa Clause Lane in the 1980s under the St. Nick statue Wilson so loved. “I was Bad Santa way before the movie came out,” he said. But people change, and cities do, too; rising rents forced Wilson to relocate. This year, the long-cleaned-up Wilson has pulled his guitar out once again and taken to writing songs, including “Song to Old Santa Barbara,” a lament for the easygoing paradise of Wilson’s youth, “when rents were low and living was easy,” symbolized in the relocated Santa statue. “The middle class is being squeezed out. The bricklayers, firefighters, teachers, cops — they can’t live in S.B. anymore,” he said. The wealthy have “destroyed what they’ve come to find. Too many people try to climb into Shangri-la, and it’s gone.” Like his old photo, the new S.B. is barely recognizable to Wilson. He’s fully aware, however, that his is not the first group to be kicked from this seaside locale, where centuries of exclusion have nearly erased the Chumash. “I inherited S.B. because the other people have been pushed out,” he said. 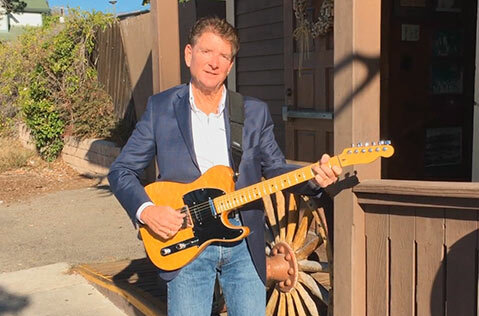 Wilson asks listeners to donate to Santa to the Sea, which gives gifts to underprivileged children in Ventura County; he calls the song “a redemption.” Wilson’s a changed man these days and hopes this song brings a smile to others. Change may eclipse yesterday, but as Wilson shows, there can still be brighter tomorrows.